This is a fascinating and spectacular church, probably the least visited of Suffolk's great municipal Perpendicular churches, despite being only ten miles or so north of Southwold and Blythburgh, with which it forms a group. It is one of the county's biggest churches; and yet, of the other big medieval ones, only Hadleigh has suffered a more drastic 19th century makeover. But there is much of interest here, and a visit is worthwhile for all sorts of reasons. Lowestoft's only major town centre church is the beautiful Our Lady, Star of the Sea. St Margaret stands on a hill top to the west, which may seem strange, but the same was true once of the church at Aldeburgh, although the sea has cut in there to make the church appear more central. In both cases, the towers are able to act as a landmark to ships at sea. All along this coast, the sea has claimed churches in the last 600 years; six at Dunwich, and others at Easton Bavents, Sizewell, Gedgrave and so on. At Pakefield, the church was half a mile from the sea as recently as 1900; but today, the waves lap at the foot of its churchyard. In another 50 years or so, Pakefield church will be gone, and so will Covehithe. But not St Margaret. The unpredictable nature of the tides has meant that the sea at Lowestoft has actually gone out; the industrial estate on the Denes below the High Street was under water 500 years ago (many would wish it a return to that state). With the town below it, and no major road leading past it, St Margaret is not a church to come across by accident. It is surrounded by a large modern housing estate, but the great size of the churchyard keeps it at arms length. I have never seen so many gravestones in a churchyard anywhere else in East Anglia. They cluster and lean together like a Jewish cemetery. 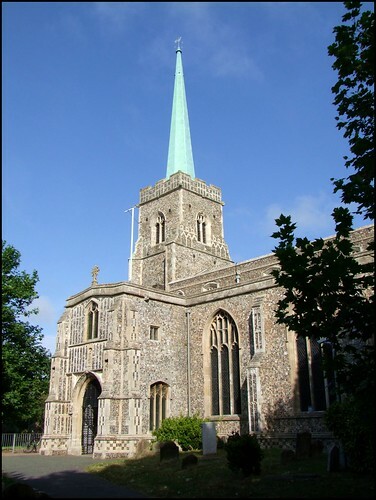 Like most great Suffolk churches, St Margaret was rebuilt several times during the Middle Ages. The 14th century gave it a grand tower, but this was completely dwarfed by the massive nave, aisles and chancel built in the 15th century. The Reformation intervened before the tower could be rebuilt to scale, and so it appears curiously mean beside the body of the church against it, exactly the same situation as at Blythburgh, with which this church has many similarities. The 15th century builders put an elegant lead and timber spire on the tower, possibly as a temporary measure, but it stands there to this day. The porch is one of Suffolk's largest, a double-story affair as at Blythburgh. The upper storey may have been an anchorites' cell, an to this day is referred to as 'the Maids' Chamber', and their names are recorded in folklore as Elizabeth and Katherine. In the vaulting of the lower stage is a magnificent boss depicting the medieval image of the Holy Trinity. A seated God the Father golds his crucified Son while the dove of the Holy Sp[irit descends from above. A sign says Welcome - but the door is ordinarily padlocked, because we are in Lowestoft, and that is the way the parishes of Lowestoft keep their churches. However, the people here are very happy to open up. If they let you in, it will be through the Priest's door, so your first sight of St Margaret will be the huge Victorianised chancel, and the vastness of the nave opening out beyond it. There is no chancel arch; as at Blythburgh and Needham Market, this is intended as a great Perpendicular space. You step down into the wide nave, filled with turn of the century benches. At the far west is the gorgeous font cover, the work of Ninian Comper, much more elegant than his enthusastic work at nearby Lound. Behind it in the west wall is the rather alarming door to England's biggest banner stave locker. It is based on the one at Barnby; unfortunately, the original is only about 4 feet high, and this has been made to scale at three times the size. Given that the Barnby one was unfinished, is remarkable for its existence rather than its style, and was hanging upside down at the time it was copied, it seems a curious thing to have done. The great east window is filled with 1890s glass, which isn't terrible; but what it replaced was rather more interesting. In 1819, the window was filled with glass by the Regency artist Robert Allen. It is his only known glasswork, and is terribly rare. Fortunately, much of it was reset in the south chancel, where you can see it to this day.It seems curiously primitive and dated, a fascinating example of vernacular window painting on the eve of the 19th century revival. Interspersed with it is a collection of interesting continental glass, probably collected and set here by Samuel Yarrington. The gorgeous glass in the west end and north aisle came from the demolished church of St Peter. It has lost some of its drama by being moved into such a large space, but is still excellent. It is by Christopher Whall. I also love the memorial window to Lowestoft's fishermen drowned at sea; it shows one of their patrons, St Andrew. There are a great many memorials of interest, including a large number of ledger stones. One of these is to the 17th century puritan Samuel Pacy, who, as Mortlock reminds us, was partly responsible for the great witch hunt hysteria in Suffolk during the 1660s. He himself accused two local widows, Rose Cullender and Amy Drury, who were either harmless medicine women or Catholics, or probably both, of bewitching his daughters. They were hung at Bury St Edmunds in 1664, along with 38 other innocent women and children. It always seems odd to me that the 19th Century evangelical protestants of Bury erected a memorial beside St James to the 17 Suffolkers murdered for heresy during the reign of Mary I in the 1550s, but this equally foulact by their puritan forbears has been forgotten. Another most curious memorial is on a brass plaque on the chancel arch; it says To the Glory of God and in Thanksgiving for the Safe keeping of the Church and Congregation in the Violent Thunderstorm of Sunday Aug 21st 1921. The roof is rebuilt, so we are deprived of seeing one like that at Blythburgh, which it probably was once. It has been painted and guilded, and I wonder if this was also the work of Comper. The nave is full of inlays for brasses, most of which, sadly, have disappeared over the years. A few remain. The view to the east, with nothing breaking the roofline until the east window, is magnificent. There is a reconstruction of a parclose screen and loft in the north aisle, which was intended to continue across the church. If this had happened, it would have been a better and more impressive reconstruction than that at Rattlesden. Finally, this church has one of Suffolk's few medieval brass lecterns; one of the few survivals here, apart from the font, of the Catholic life and liturgy of this place before the Reformation.